Each lesser toe is made up of 3 small bones (phalanx) attached to the foot knuckle bone called the Metatarsal. Deformity of the toe usually develops through the joints connecting each of the bones together. The joint where the toe meets the foot is the MetaTarso-Phalangeal Joint (MTPJoint). Why do clawed toes hurt? Direct rubbing inflammation of the prominence in footwear. Pain in the joint itself if associated with arthritis. Hammer toe causes the toe to bend down towards the floor just at the proximal inter-phalangeal joint. This can cause the metatarso-phalangeal joint to bend up. Splayed Toes occur when there is an increased gap between two toes. This may or may not be painful. Surgically addressing this deformity is more involved and will be discussed by your surgeon. Overlapping Toe occurs when two toes cross over one another. The commonest is the second toe crossing over the first toe in a bunion deformity. How are the deformities assessed? Establishing the history and symptoms of the foot. How, when and why does it affect you? An understanding of your role at work, in social activities, different footwear helps us in understanding your functional demands. Any underlying medical problems, medications or allergies must be brought to the attention of your surgeon. They can influence the safety of treatments and subsequent results. What are your ideas, concerns and expectations. A full examination of your foot and occasionally more. Determine the extent of the condition along with trying to establish any background cause. Fixed or Flexible? - This is a term used by us to determine the type of surgery necessary to correct the deformity. It simply describes whether we or you can put the toe deformity straight manually. A flexible deformity can generally be managed by soft tissue surgery where as a fixed deformity tends to require an operation involving cutting bone. Commonly used to establish the degree of deformity and any associated arthritis or concurrent problem. These deformities often form part of a more complex foot problem that needs to be considered both for information and occasionally surgery. Whilst clearly painful and to some disabling this condition is not life threatening but quality of life affecting. It is important to see if your symptoms can be managed without surgery to your satisfaction. When surgery is then discussed it is done so in a considered manner aware that there are risks and that expectations need to be appropriate. Padding or protecting with a silicon sleeve or ‘corn plaster’. Podiatrist assessment may be sought with a view to establishing any contributory biomechanical factors from your foot’s posture or function. Orthoses (insoles) can be of good benefit. Any corns can be attended to with local techniques. On occasions a bespoke shoe can be made to accommodate the deformity if severe. Chiropodists specialise in the management of corns. Whilst corns are a natural response to the underlying deformity they are in themselves painful and can be helped by these experts. Simple painkillers and anti-inflammatories can help settle an acute flare up. These measures are often sufficient but can take time to settle symptoms. They should be strongly considered before discussing surgical correction. There are of course both medical and social reasons why many people may choose to persist with these treatments rather than adopt surgery even with only partial relief. There a number of operations described for treating these problems and each has their advantages and dis-advantages in certain situations. I will adjust where necessary to optimise the result as I feel is best and discuss this with you. The purpose behind this type of surgery is to improve pain and mobility making the toe and associated forefoot more comfortable. As part of this we usually aim to straighten the toe but it will end up a different length and with an altered feeling. It can feel a little floppy or rigid to move long term but your pain and mobility symptoms should be much improved. What in principle is involved in the surgery? Through a top incision the tight structures around this joint are released including the tendons, ligaments and capsule to allow a relaxed correction of the joint. One tight tendon (EDL) is lengthened and usually repaired whilst the lesser tendon (EDB) is just cut. 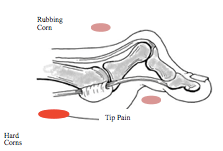 Through a top incision any corn will be excised before cutting a section of the tendon to access the joint. A fine saw is used to cut out the joint, thus allowing toe to be straightened. A fine steel wire is inserted holding the correction with the cut raw ends of bone pushed together. The principle being that either scar tissue or bone forms between the raw ends holding it straight. Plantar Plate Repair – A sewing technique that repairs a torn soft tissue pad under your knuckle bone (Metatarsal head) back to bone. Big Toe (1st Toe) Correction – This will occasionally accompany lesser toe correction in a ‘Forefoot Correction’. Rest with your foot elevated “Toes Above Your Nose” reclined in bed or on the sofa using extra pillows for height. The pin is removed in clinic by hand or with small plier. This usually very tolerable with momentary ‘bee sting like’ sensation. Continuing recovery will be guided cases by case from this stage depending on the details of the procedure done. Bleeding: A Small amount of bleeding is to be expected following surgery. A small patch of blood on the dressing is not uncommon. There is usually nothing to worry about if this happens. Bleeding seen to drip from the toe or be soaking the dressing should be immediately reported. Infection: A localised infection to the skin occurs in my experience in about 1:50 cases and requires a course of antibiotics. This usually has minimal consequences. However if infection gets in to the bone (very rare) the wire will be removed early, potentially compromising the result and in extremely severe cases needing amputation of the Toe. Infection appears as increasing pain, redness, pus or feeling unwell – please report any concerns of this to a nurse or doctor. Nerve damage: The nerves to the toe are very small and often need to be retracted during surgery. In the majority of cases any damage is minor and causes tingling and numbness for a short duration of time. This may last a few weeks. Usually after this period it recovers. In the rare situation where the nerve damage is more severe, you may have permanent numbness in the toe. Fracture: There is a risk of fracturing your bones during this type of surgery. If this the case we may need to repair the fracture during the operation. This may compromise the overall result. Metalwork problems: The stainless steel pin can occasionally fall out, become bent or stuck or get infected. This will be reviewed regularly in clinic. Stiffness: the toe may become stiff. Usually this is not a problem. In fact making one of the joints stiff is the aim of the operation. Floppy Toe: The toe will be slightly shorter if a joint is excised and this can render it occasionally floppy. This occurs not infrequently and if pain free should provide no disability and is an accepted side effect of the surgery. Recurrence: In a small number of cases, the deformity may recur and may need a further operation to correct it. Loss of toe: One of the very rare complications of this operation. This may happen if the blood vessels to the toe are disrupted as a result of surgery, or if there is deep-seated infection of the bone which your doctor cannot get rid of. Thrombosis (DVT/PE): One of the consequences of surgery of the lower limb is a small risk of developing a clot in the leg (DVT), which may dislodge from the leg and enter the lung (PE). Fortunately this is rare but a PE is a potentially life threatening complication of the surgery. Should you get any symptoms of un-relieving calf cramp or swelling, Chest pain or Shortness of Breath seek urgent medical attention. Complex pain reaction: Very occasionally the nerves in the foot or toe react in an abnormal manner, causing disproportionate pain despite the surgery having technically gone well. This is situation is frustratingly difficult to treat and unpredicatable. It may require longterm medications including antidepressants to treat..
Swollen Toe: The toe will be swollen for a period of time after the operation. By 6-9 months the toe should return to its normal size. Floating Toe / Elevation: This is when the toe will not come down to touch the ground when walking. This is a rare complication but can be corrected with simple measures such as taping of the toe. This type of surgery is made up of many small parts to a relatively small area. It does have risks and the toe is never made ‘Normal’. It is however recognised as a reproducible technique of improving the symptoms from the deformity. Always feel free to ask questions and ensure you understand what you are taking on before the surgery and get confidence in what is being undertaken. If you would like to arrange a consultation to discuss your foot or ankle problems with Mr Williams, then please contact us.